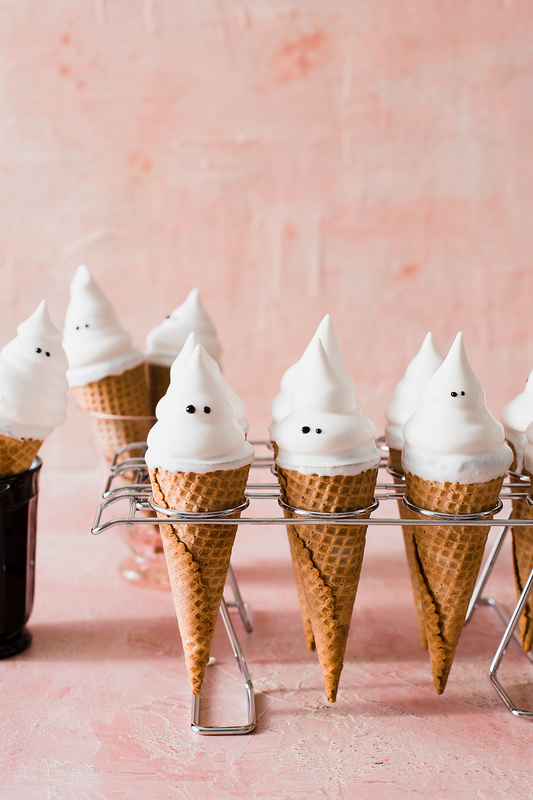 Cute and spooky ghosts made from spiced chocolate cake batter baked in crisp sugar cones and topped with a swirl of vanilla bean swiss meringue. I know I am totally ahead of the schedule for Halloween treats, but I just couldn’t keep these from you. I love that I’m in a stage of life where I can share similar things from my childhood with my kids, like conecakes! Have you ever had a conecake before? When I was a kid my mom would make them in cake cones (the wafery, flat-bottom cones) and I LOVED them. 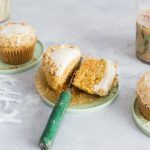 Not just for their novelty–I mean, once frosted they look like ice cream cones–but also because there was some magical texture thing that happened between the cake and cone as they baked. The cake semi-absorbs into the cone for a chewy, crunchy, exterior and a fluffy cake interior. I distinctly remember my mom balancing a baking tray of the conecakes to the oven and thinking she had some serious skills. 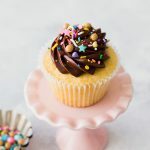 Now, thanks to Wilton, there’s no more need to balance a wobbly tray of cupcakes to the oven, because they have this nifty cone holder that keeps your cones upright while baking which means you can use a sugar cone too! Wilton sent me a box of goodies to play with and I really wanted to make some sugar cakecones into hi-hat ghost cupcakes. I like to keep it fairly low-key when it comes to crafty holiday treats–I’m not going to be carving a cake into a witch or erecting a gingerbread mansion anytime soon. but I can definitely dip some cupcakes into candy melts and dot on some eyes. 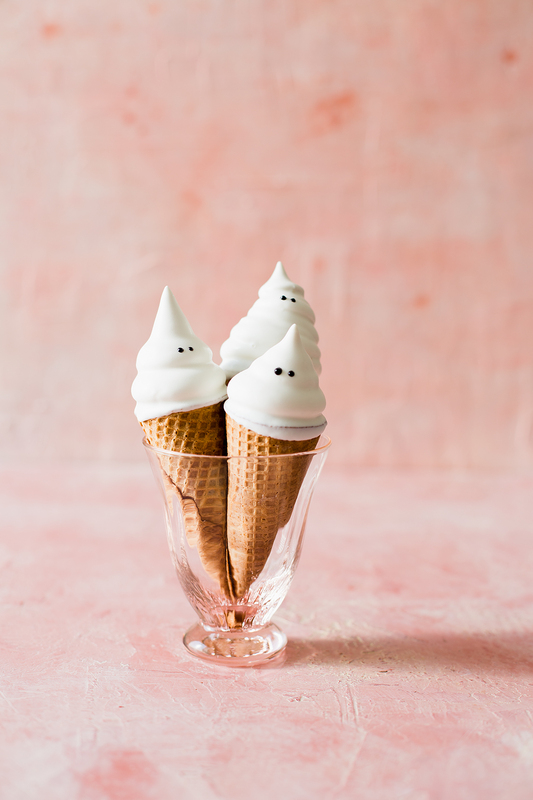 These ghostly treats begin with a spiced buttermilk riff of my favorite chocolate cupcake batter baked into crisp sugar cones. 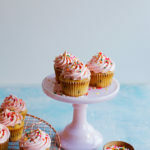 I went for a marshmallowy, vanilla bean, swiss meringue instead of a buttercream–since a tall swirl of frosting is required for these hi-hats I wanted something that wasn’t too rich to eat. Then I dipped each cloudy peak into a mixture of white candy melts and a little coconut oil to thin it before dotting on some simple eyes with black decorators gel. The process takes a few steps, but it’s pretty simple to execute but has a big impact. Casper spotted these in the refrigerator after school and was thrilled that he got to eat one…and we even got Sean to believe that they were ice cream cones at first! Don’t overfill. I learned very quickly that cupcakes baked in cones overfill very easily. These don’t need a lot of batter to fill up the cones so aim for 1/2 to 2/3 full of batter for each cone (instead of the 3/4 you often see for cupcake recipes). 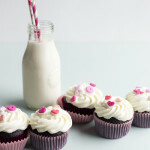 You’ll have lots of leftover batter that will make about 24 mini cupcakes or about 6 standard cupcakes. Chill out. Make sure to chill the frosted cones before dipping. You want the meringue to be cold so it doesn’t melt off when dipped into the coating and so the coating sets up quickly. The coconut oil in the coating will help with setting it quickly on the cold meringue. Cold storage. I baked a batch of these in advance and stored them at room temp in an airtight container. What I found was that the cones became very soft after absorbing the moisture from the cupcakes and most of them started to unravel as well. I recommend baking these the day you plan to assemble and storing the finished conecakes in the refrigerator on the cone cake rack. Special Tools. I used a few special products to make this project easier. Links for the specific products below. Everything listed was gifted from Wilton (disclosure at the bottom of the page). Fit a piping bag with a large round tip and fill with the Vanilla Bean Swiss Meringue. Pipe swirls onto the conecakes ending in peaks. Refrigerate the conecakes in the cone rack until the meringue is well chilled, at least 1 hour. Once the conecakes are chilled, melt the candy melts with the coconut oil in the microwave in a 2-cup measuring glass for 30 seconds at a time, stirring after each time until smooth. Pour the coating into a tall glass--like a pint glass or tall drinking glass. Remove the conecakes from the refrigerator and dip the frosted tops of the conecakes into the coating and let the excess drip off before turning upright and returning to the cone rack. Repeat with all of the conecakes and return to the refrigerator to set about 30 minutes. Once the coating has set and is dry the to touch, decorate eyes onto the ghosts using the black decorator's gel. I squeeze some gel onto a small dish and use the end of a chopstick to dot on the gel, this allows for more control than squeezing it from the tube. 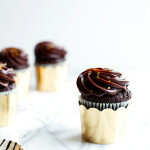 Serve the cupcakes at room temperature. Refrigerate for up to 2 days. Preheat the oven to 350°F. Place 12 sugar cones in a Wilton ….. on a baking sheet. Whisk the flour, cocoa powder, baking powder, baking soda, salt, cinnamon, ginger, cayenne, and sugar together in a mixing bowl. In another bowl whisk the buttermilk, canola oil, eggs, and vanilla together until well mixed. Add the wet mixture to the dry cocoa mixture in the whisk to combine--the batter should have few to no small lumps. 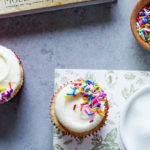 Fill the sugar cones about ⅔ full and bake in the center of the oven for 20 minutes or until the tops of the cupcakes spring back to the touch and a toothpick inserted in the center comes out clean. Remove from the oven and cool on a rack completely before frosting. Bake the remaining batter as 24 mini cupcakes or about 6 standard sized cupcakes for 15-20 minutes. Mix the egg whites and sugar together in the bowl of a stand mixer. Set the mixer bowl over a pan of simmering water (making sure the water does not come in contact with the bottom of the bowl). Stir the egg white mixture over the pan of water until the sugar has dissolved and the mixture is hot to the touch. Test by dipping a finger into the egg whites and rubbing between your fingers. It should be hot (but not burning) to the touch and should not have any grains of sugar. If it is still grainy, keep stirring over the simmering water. Once the mixture is ready, remove the bowl and fit it onto your stand mixer. Beat on medium speed with the whisk attachment for several minutes until it becomes white and glossy. Turn the mixer to high and beat until the meringue is fluffy and holds medium peak (one that holds a tip that falls over when upright). Add the vanilla bean paste and salt and beat on high until the meringue holds a stiff peak. Use right away. Wilton is one of my favorite baking supply brands and I used a few of their products to make these conecakes happen. Their products have been staples in my kitchen for years. While I did receive products from Wilton to use in this post, I was not further compensated. Recipes, writing, and opinions are all my own. These are so crazy creative! And BEAUTIFUL. I love them! !